This cache came up for review while going through all the ones that have been made temporarily unavailable for more than 30 days. As cache owner, it is your responsibility to either repair or archive any caches that are no longer acceptable for Geocachers to hunt. Since you have failed to respond to the request for maintenance, we are archiving the cache. Ammo Can hidden as a part of the Cache Across America Series. Please replace the cache exactly where you found it. Since this is connected to a larger series, I want everyone to be able to find it. I have included my cell number in the hint as a lifeline for those of you from out of town. Find the other caches in the series HERE. The Cache Across America Series: This is a series of caches that will take you on a caching tour of the entire United States. One cache is hidden in each of the 50 states. These caches each contain a numeric clue that will lead you to one final cache located in our nation's capitol upon completion of the series. About this cache: If you are attempting to complete the entire Cache Across America series, you are sure to put some miles on your vehicle. I am sure only a few of us are lucky enough to be able to drive the same kind of cache-car that is honored here. What a better to place to stop on a series dedicated to America than a museum dedicated to the American Sports Car!! You will definitely want to cruise in to get this cache which is located at the National Corvette Museum in Bowling Green. If at all possible, you will want to make time to visit inside the museum as well. The 68,000 sq. ft. building houses more than 50 Corvette models and one-of-a-kind concept cars spanning the history of Corvette. Also on hand are thousands of Corvette related photos, movies and videos, advertisements, scale models and rare memorabilia. 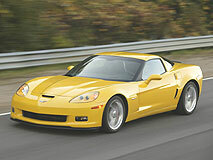 Spotlighted are the people who have made Corvette an American icon. Inside, striking full-scale dioramas show classic Corvette models and famous performance Corvette models in period settings. You'll also find the historic one-millionth Corvette, donated to the museum by Chevrolet. You may also want to visit the Bowling Green Assemby Plant, where the Corvette and Cadillac XLR are made. This cache is a hidden ammo can that was placed with permission from the Events Manager at the Corvette Museum. It is conveniently located right off I-65 and is in an ideal location for travel bugs. The posted hours of the Museum and this cache are 8am-5pm 7 days a week excluding major holidays. Be sure to bring your lunch – there are picnic tables nearby. Logging Requirements: Enjoy this cache as you would any other. If you are searching this cache as a participant in the Cache Across America series, please post a photo of yourself or a member of your group with the cache in your online log. If you for some reason are unable to meet the photo requirement, please make alternate arrangements to verify your find with the individual cache owner. There is no photo requirement for non-challenge participants. Individual verification of all 50 state finds will be required before logging the series final. If participating in the series, please take note of the three digit code located inside this cache. Save this code in a secure place. When you have visited all 50 caches, and have collected all 50 codes, you are welcome to seek and find the final cache! Good luck!